Why won't my cat use the litter tray? 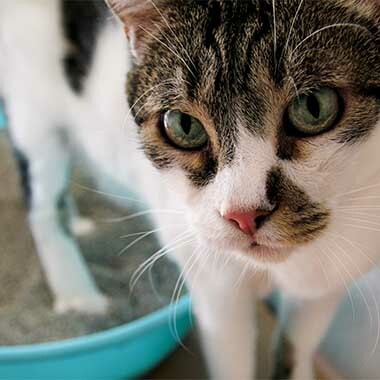 Does your cat refuse to use a litter tray? There could be for any number of reasons. Read our cat training cat advice for using litter trays. A general rule of thumb, especially for indoor cats, is that you need to provide one litter tray per cat, plus one spare. Cats don't tend to like to share their toileting facilities and, being fastidious creatures, prefer their tray to be clean each time they visit. Try altering the type of litter you use. Some cats have a preference. Make changeovers gradually, mixing the new litter in with the old. If you've been using a large granular litter, change to a finer product, and fill the tray so your cat has a good depth to dig in. A litter which clumps when wet will enable you to keep the tray cleaner. Scooping immediately after the litter tray has been used, and replacing the litter at least once a week suits most cats. The tray shouldn't be cleaned with highly perfumed disinfectants - and avoid those containing phenols as these are toxic to cats. It's best to clean the tray with a specific litter tray cleaner, or a warm water and ten per cent biological washing powder solution. And ensure the tray is completely dry before adding new litter. Litter tray design is also important. Make sure the tray is large enough for the cat to move around in and, if he's older, that he can easily climb in and out of it. A covered litter tray helps to provide privacy, along with helping to ensure litter remains within the tray, but this might not suit all cats. On the subject of privacy, think about where you have positioned the litter tray. If your cat was disturbed or frightened while using the tray, he may be deterred from going back to use it again. Instead, place it in a quiet room where he won't be disturbed by people or other animals passing by - a utility room or downstairs toilet for example. Whether a genuine accident or not, once the cat has urinated or defecated at a particular location its sensitive nose will encourage it to use that place as a regular toilet. The best way to break the habit is to keep the cat away from the area as long as possible, remove any smell that the cat can detect and change the geography of the location by using pieces of furniture to block access. Wash the area with a 10 per cent solution of biological or enzymatic washing powder and then rinse with cold water and allow to dry. Spray the area (using a plant mister) with surgical spirit, scrub and leave to dry. You may want to try a small area first on delicate fabrics. Carpet is extremely absorbent and the urine often penetrates the full thickness of the carpet to the flooring underneath. If the area is badly soiled over a long period, it may be necessary to cut out the section of carpet and underlay and treat the concrete or floorboards underneath before replacing. If your cat normally uses a litter tray but has recently started to go elsewhere in the house, there may be an obvious reason. Early training: Kittens will often soil in the house when they are young if they are given immediate access to large areas. When kittens first arrive in their new home, they are only weeks away from their original litter training by their mother. Their bladder and bowel control are not as developed as an adult's so it is important that the young kitten has easy access to the litter tray at all times. It is advisable to confine the kitten to one room initially, with increasing periods of time to explore other areas after a few weeks. Every time the kitten uses the tray it is establishing an entrenched behaviour that will be maintained throughout its life.? A cat that has started to urinate inappropriately in the house should be taken to the vet for a check-up. Cystitis may cause the cat to strain and pass small amounts of urine frequently. A form of urinary tract disease that is stress-related is less obvious in its presentation, but one common symptom is urinating outside the litter tray. Any urinary tract infection or irritation can make the cat urinate when standing rather than attempting to go outside or to the litter tray. Urination in this way can sometimes be confused with spraying. Cats often benefit from increased fluid intake if they suffer from recurrent cystitis. This may require your cat to change from a dry diet to a wet one but your veterinary surgeon should be consulted regarding any dietary management.